Let me first start by saying I didn’t pay for ANY of the products and services I am about to mention. This list is more of an example of what one CAN accomplish with certain resources. …so the crazy winter rain in LA finally got to me. Plus all of the carby cold weather food I’d been eating hadn’t helped my cause either but that’s another story. After a Iate night sneeze attack, I woke up with full on body aches and a sore throat. After drinking a liter of filtered mineral water throughout the morning, I decided on a smoothie, which was what I do almost everyday anyway. 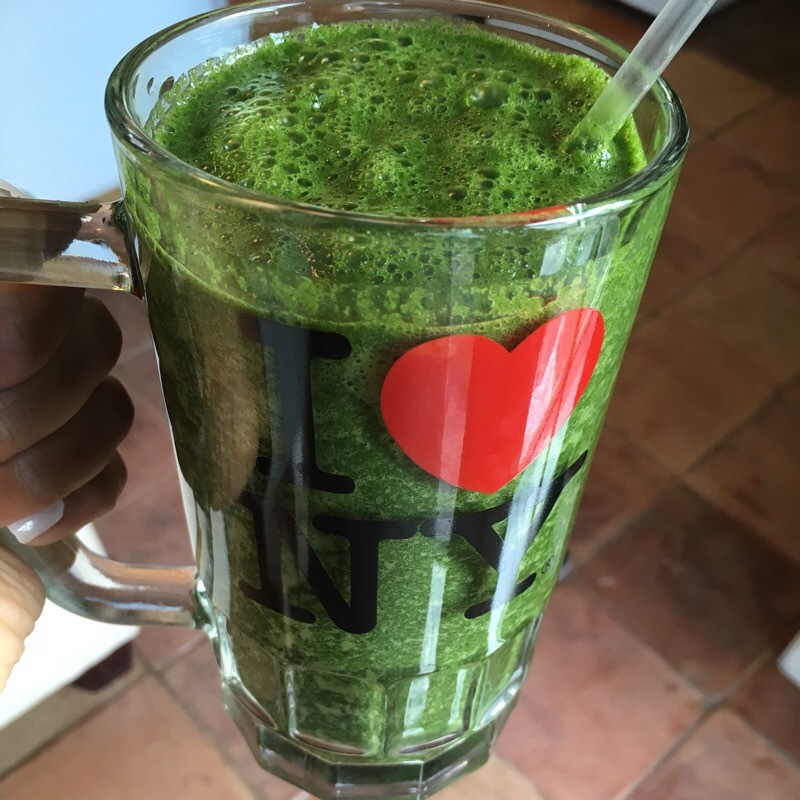 To help along the process however I made it super green – I mixed a (kinda sad) bunch of kale with green apple, chlorella powder, fresh grapefruit juice and ginger for a really bitter, spicy yet effective smoothie. Good thing I couldn’t taste it. I spent the rest of the morning drinking more water and ginger tea. 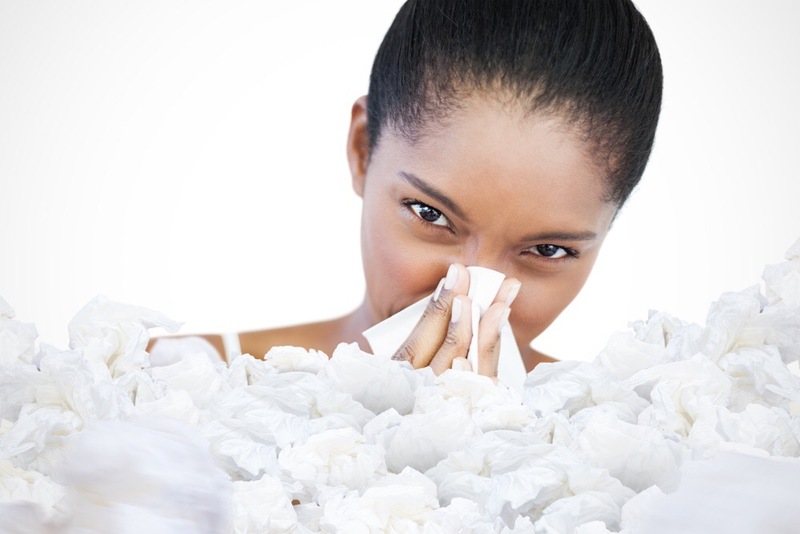 I’m a big believer of the “starve a cold” method, but to be honest I feel that way about most illnesses. Digesting food takes away energy that could be used to fight the virus (plus you’re usually too congested to taste anything good anyway). Although LA put me in this sickly position, it was actually the most qualified to get me out of it. With a population of mostly hippies, health nuts and Hollywood types, without a doubt Los Angeles is the wellness capital of the USA. 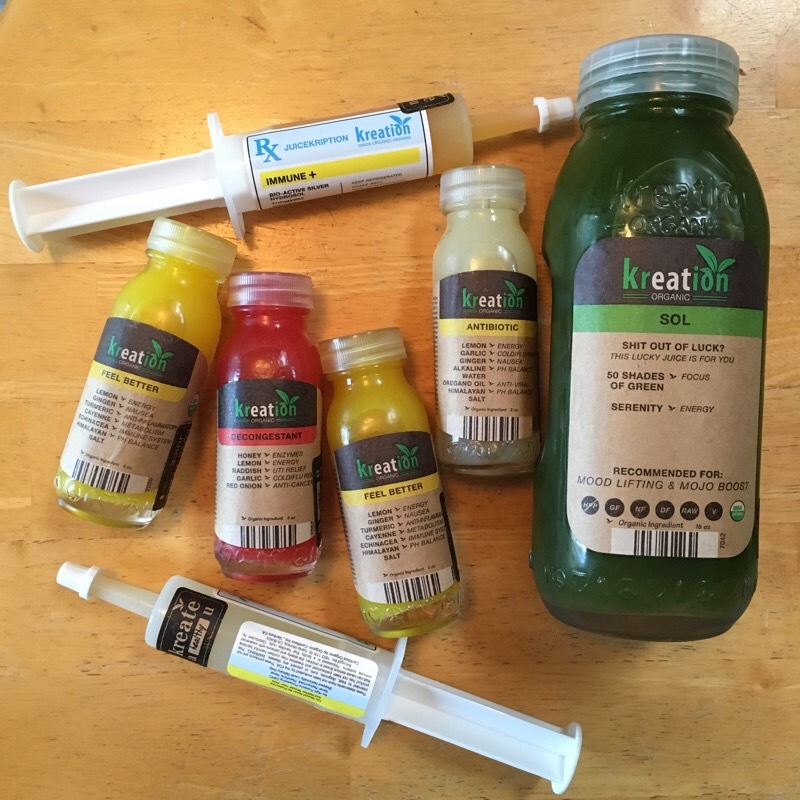 Kreation Juice comes to your door with fresh pressed juice names like “Antidote” in syringe shaped containers. Interesting..but it was the glass juice bottles that won me over. The Santa Monica spot features a full menu of juices that can definitely speed recovery. Although many of the combos looked and smelled a little intimidating (even for me) they all turned out to be delicious. Look out for a recipe on the site inspired by the Kreation Juice “Decongestant” Shot (with honey, radish, red onion and lemon) soon. Because I wasn’t eating much this Kreation “Juice feast” worked out great, the spiciness truly kept me from getting congested plus the green juice was as filling as a meal for the rest of the afternoon. I wanted some comfort food but I still wanted to keep it light so I went with my favorite take out tomato soup and salad from Tendergreens. The portion was big enough and my appetite was small enough that worked out for lunch the next day as well. My next tactic is definitely not available to everyone but worth mentioning just in case it is. My neighbor, who trains let me borrow his nebulizer, something I’d never had a need to use, as it’s mostly for asthmatics and people under serious respiratory medical care. And despite seeing the Blue Man’s photo pop up in my Google search of the treatment (many argue it’s a fraud). I decided to give it a shot. Although I was advised to breathe the vape for an hour I could only do it in small increments, I’d never had any breathing problems and never needed breathing assistance so the whole act of breathing through this device was a bit odd. I also sounded like Darth Vader. For bedtime I decided to keep it old school, I simply cranked up my humidifier to greenhouse levels, sprayed eucalyptus around and prayed for a better day. The sweatheory manager greeted me with a shot of a cayenne concoction and showed me to my sweatheory sweat-space. The vibe was great, my own personal little hot box and shower that I could scrub myself down after, I was already happy. I chose a meditation CD that had the name of NBA “Zen Master” coach Phil Jackson scribbled on it which turned out to be surprisingly awesome. Since the skin is the largest organ, sweating is one of the most effective ways of eliminating waste and toxins. Under the controlled temperature of the sauna you are able to get an even bake and by alternating your session with cold showers you aid in the body’s proper circulation. My cold didn’t have a chance. Definitely pricier than the pharmacy…but natural treatments usually come with extra benefits…as opposed to a long list of side effects. Not only did the sauna help to purge out gunk, it made my skin soft like butter for days after. Giving my digestive system a break not only freed up extra energy to fight the cold, it also deflated the little pooch belly I was getting after weeks of cold winter food (AKA anything baked and brown). And who couldn’t use the extra sleep? In the long run it’s better to give the body more of what it needs to eliminate the problem instead of suppressing it, only for it to come back…which is much more expensive. In the meantime below are a few ideas that won’t break the bank. No Juicer or blender? Eat plenty of fresh fruit and water. No humidifier? Boil a pot of water on the stove for an hour. Breathe into it periodically and let the warm air fill up your space if possible. No nebulizer? Take big, natural breaths, the more oxygen you get to your cells the better they can work for you. No sauna? Let the shower run on on hot for a few minutes with the door closed while you sit inside, adjust the water and shower and scrub.